Pigeons are natural seed eaters and only eat insects in small numbers. Normal pigeon diet is made of corn, wheat, cereals and other seed. Pigeons will add fruit and green like lettuce, spinach, sprouted seeds, grapes and apple in their diet. Pigeon is a common bird around the world, along with a dove. These two birds are related to each other and live side by side. Pigeon is bigger from the two and the dove grows a little smaller in size and color. A young baby pigeon or dove are called squab. One interesting fact is that a pigeon have only forty taste buds, compared to a human that has thousands. The food may not taste so good with small number of taste buds, but pigeons keep eating it up. Pigeons are well adapted to human environment and will live on buildings and cavities in houses. They will take advantage of food leftovers by humans also. They have stout bodies and necks that are kind of short. On top of that they have a slender bill. A pigeon’s diet in the wild and for pigeon keepers. A pigeon is kind of a scavenger bird and will go around looking for anything he can find to eat. But it will have its favorite food, as it is a bird after all. If you like to feed pigeons you can give them leftovers, as they will love you for that and come back for more. But this is not a normal diet of pigeons. If you keep pigeons you want to feed them properly so you must provide a better diet. The pigeon is a granivorous bird. Keeping that in mind, they like to eat seeds and cereal grains, Cracked Corn, sunflower, wheat, barley, millet, Pigeon & Dove Seeds and peas. They will eat all of those seeds at any time of year, but some are more preferable in different times of year. In winter more oil based seed is desired to help them through the cold. When the molting season starts pigeons will change the diet. The same thing will happen in time of reproduction and raising young. It is best to feed pigeons with a mix of all seed so he will get all that he needs. Pigeon mom and dad that have a baby will need more diversified food to feed the young. The baby needs to grow and needs lots of nutrition. Healthy pigeon needs a balanced Pigeon & Dove Seeds diet that contains 50% grain crops and 10% oil seed (sunflower). Normal adult size pigeon can eat about 30 grams of food each day to keep him in good condition. Young baby pigeons eat different food and you can check what to feed a baby pigeon with. If you keep racing pigeons same rules are applied but you might adapt the needs for a particular pigeon. If you want to feed pigeons in the wild, what do pigeons eat there? You don’t have to worry too much, as pigeons will find food in other places and come to your feeder just to supplement its diet. If you have found a baby pigeon read this. It’s a great article about how to raise baby pigeons and you must read it if you have a baby pigeon. It’s a great source of information on what do baby pigeons eat. - Cereals are good main diet of a normal pigeon. This food is made of 70% carbohydrates, about 10% of protein and 5-7% fat and minerals. These elements are important because they are rich in vitamins B and E, but lack vitamin A. 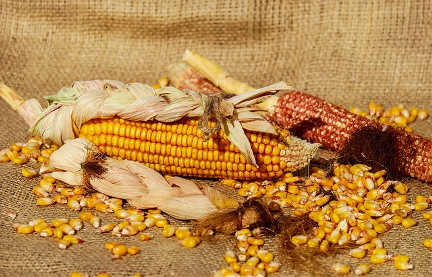 Corn on the other hand does contain vitamin A. - Wheat is rich in carbohydrates and must be given in smaller amounts. Too much and your pigeon will become “fat”. So give it in a smaller doses. - Corn is very good for pigeons and must be included in the diet if you keep pigeons. Cracked Corn has high energy value, lots of proteins and it is good for pigeon digestibility. But if given in too much amounts it can also lead to weight gain as it is rich in calories. - Oat is not favorite by pigeons but is good for the feathers. It will help them in cold weather and build the muscles of these birds. It gives a good boost to the pigeon blood and nervous system. Do not give it to much if pigeons are laying eggs, as it is not so good for egg shell. Pigeons don’t like oats so much, but it is good for them. 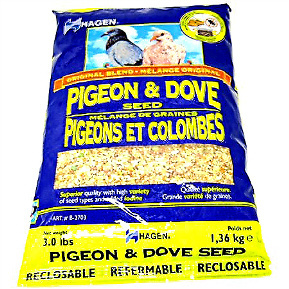 - Mix of Pigeon & Dove Seeds is great for a balanced pigeon diet. - Barley is good for pigeons in cold weather in the months of January and February. The young pigeons are not able to eat this food and it’s not good for their digestive track so give it only to adults. On the other hand adults will benefit from it, as it is producing a calming effect on the bird stomach and will reduce diarrhea. So place it in the pigeon diet as it will give lots of benefits. - Rye has a lower nutritional value for the pigeons than wheat or corn and it is not really so much beneficial for pigeons but can be given as their food. - Pulse – Pulse is good as it is very rich in protein (22-40%) but very low in fat (1-5%).They are particularly good for birds because of rich amount of phosphorus and calcium salts. They contain beneficial quantities of B vitamins, especially vitamin B1, but less carotene. - Peas contain about 22-26% protein, 50-52% no-nitrate substances, 0.1 to 2% fat and 4-5% cellulose. It is a good protein source. Birds will digest it very easily. It can be mixed in pigeon’s food in a ratio of 15-20%. Being rich in minerals it will help pigeons grow, along with the corn. It has good impact on pigeon’s organism development, increases resistance to sickness and reduces the fatigue. - Vetch is excellent nutrition for the pigeon nervous system. It is good to introduce it in smaller quantities in the pigeon diet (about 15%). If given in larger amounts it can give bowel problems to the birds. That’s why it is not recommended for young pigeons and must be given just to adult birds. It should be introduced slowly. Too often bird owners don’t know how to provide a proper diet to birds, including pigeons or doves. If this is the case birds can have health problems. If you are feeding pigeons in the wild then you don’t have to worry as pigeon will find other food sources in nature to supplement what it is not getting from you. But if you keep pet pigeons than it is important to educate yourself on what do pigeons eat. It is just common sense. The best thing is to buy ready pigeon and dove seed mix so you know the bird is getting what it needs for a healthy and long life. Pigeon & Doves seed mix is a great all-in-one pigeon food! You can check great Pigeon & Dove Staple VME Seeds here that is full of all the right nutrition and all-in-one pigeon food. What do pigeons eat other than seeds? Insects, fruit? Pigeons and doves will not eat insects in large quantities so don’t include them in the pigeon diet. If you are raising pigeons or just feeding them on the feeder, stick to the seed grain, fruit and other greens. It is good to include fruit and some greens to the pigeon. These you can give from time to time, like once or twice a week. The pigeons and doves are best fed on a platform feeder, where these birds can land easily due to the bigger surfaces for these birds. Pigeons find normal bird feeders too small to land on and will not feed from them. Can I give bread to the birds? When feeding wild backyard bird one question often comes in mind: Can we feed bread to birds and pigeons? Looking at all the data collected over the years we can say it work just the same as for humans. Having some bread from time to time will not hurt you and can provide a good source of carbohydrates to your diet. The problem comes when we start “living” on bread daily and not diversifying our diet. The same goes for birds. You can give them bread as occasional snack and keep it at that. If you feed bread to your birds, be sure that it is fresh and not moldy as this can hurt the birds. Put out just the right amount so that birds will eat it in a few hours or it will go bad and mold can catch on it. Just like for humans breed – it is not the best pigeon diet. Birds, just as humans, need a balanced diet so keep most of your backyard food on bird seed. Give bread under 10% and your birds will be fine. Most wild birds like pigeons and ducks have good memory and if they find a place where there is food, they will come back every day. The problem is when this food source is a steady diet of bread and not normal bird seed. So to keep it healthy for your pigeons and other wild birds, offer bread on occasional basis. Never mix the bread with water, as this can make bread moldy fast and can hurt birds if the weather conditions are right. If you have bread leftovers from lunch you can even offer them to pigeons every day as long as you also offer other food pigeons like. Corn, wheat, green peas and other vegetables are great for pigeons. In most pet stores you can get pigeon and dove mix that is well balanced and will provide the best nutritional value for wild pigeons. What you feed pigeon in the long run, must be a balanced and healthy. Pigeons are intelligent birds and will know their human feeder. If they see you feeding them all the time they will follow your voice and face and come every day. That’s why you can see pigeons in parks landing on some people hands. These pigeons have learned how to recognize the person feeding them and are less likely to be afraid of them. Some are even so bold to land on their feeder head or shoulders. Pigeons will get the water from natural sources if in wild. If you keep pigeons give them always fresh water at all times, never old and stale, remember that water must always be there so birds can drink. Pigeon diet must be balanced so some Vitamins and amino acids for Pigeons are required in small quantities. Feeding nutritional vitamins to pigeon is important for maintaining healthy metabolic process. 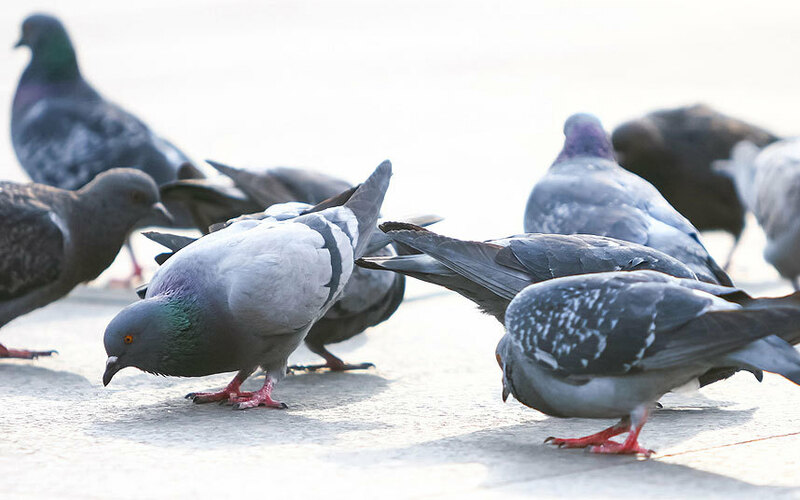 These vitamins, which are essential for pigeons, are of 6 types: Vitamin A, Vitamin B, Vitamin C, Vitamin D, Vitamin E and Vitamin K. There are sub-categories within these 6 vitamins. Each of these nutritional vitamins has its own group for the functioning of pigeon so when pigeon eats deficient diet, it shows typical deficiency signs and symptoms for these vitamins. The impact on metabolic process is proportional to the amount of deficiency to ensure that when deficiency is mild, these signs and symptoms are non-specific and vague, including poor health and functioning. Nutritional vitamins are usually not produced by pigeon’s internal system in adequate amount to meet their needs and thus it has to be consumed from external nutritional sources. That is why it's important to know exactly what do pigeon eat and supplement their diet. This vitamin is extremely important for healthy mucus membranes and skin, like for lining within mouth, cloaca and sinus, etc. This vitamin is the collection of 12 or more compounds, such as riboflavin (B2), thiamine (B1), choline (B4), niacin (B3), pyridoxine (B6), pantothenic acid (B5) etc. These vitamins and minerals are responsible for many vital functions of pigeon. Because it is water-soluble, deficiency rapidly grows when the birds are not consuming these vitamins. It is a metabolic controller. Generally in seed consuming birds, such as pigeons, C vitamin is synthesized within their liver and there is no significant benefit unless pigeon is debilitated and is not capable of making sufficient ascorbic acid. This happens specifically if the liver is not working or is damaged. This vitamin is important for absorbing calcium mineral into the body of a pigeon. Birds will make their vitamin D when they are exposed to the sunlight. This vitamin controls most of the regular metabolic functions within the cell. This vitamin is important for blood coagulation. All these nutritional vitamins can be found in green vegetables and can also be produced by regular bacteria within pigeon’s digestive tract. It is rare to have K vitamin deficiency unless antibiotics are overused which kills each of these bacteria within their bowel. Also it happens when birds are prevented from consuming their specific probiotics or droppings. If you keep pet pigeons Vitamins and amino acids supplements are a good way to keep your pigeon in good health. 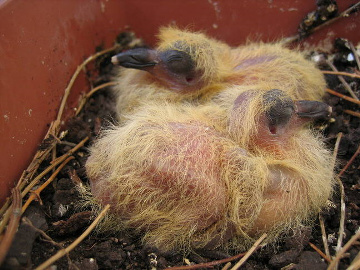 Pigeons and doves will make nests made from ticks and small pieces of debris. The pigeons will make nests in all kind of places and it is best to leave the nest at peace. Pairs are monogamous, often breeding in consecutive seasons for as long as both birds of a pair live. The nest of these birds can be built along building ledges, rafters, beams and under human bridges or inside barns. Most will raise several broods in one season. It can be from 3 to 4 in one year. The female is usually sitting in the nest for a few days. Then the first egg will be laid. Usually pigeons will laid 1-2 eggs. The couple will alternate in the incubation period as they go to feed. After about 18 days the baby pigeons will be born. After 29 days of hatching, birds will be ready to leave the nest. Pigeons come in many different colors and types. More than 20 can be found in the wild and in captivity. 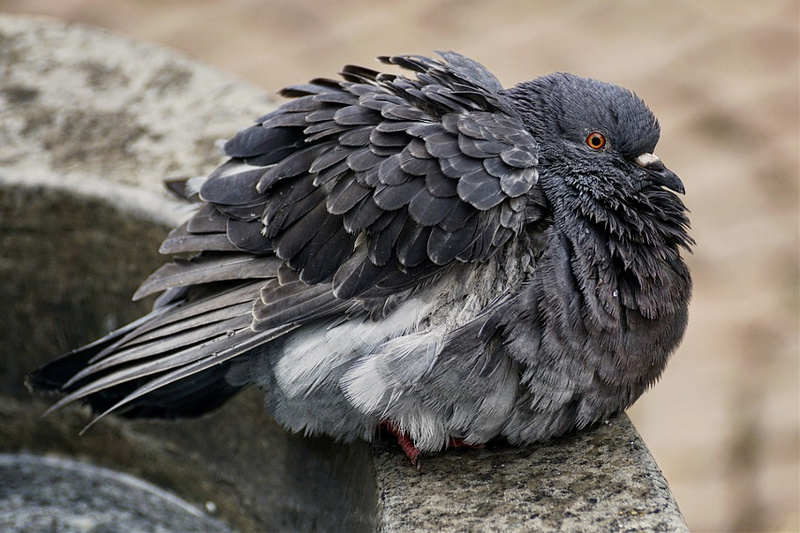 The pigeon’s neck feathers are the most common iridescent and is called a “hackle”. If you keep males and females they will often look alike, but males have a little more iridescent neck feathers. This is a bird that is like a pet and has been trained to leave home for a trip, but always “comes home to roost”. Many people love to keep homing pigeons as a hobby and breed them. However, you must have good conditions to keep these birds as their “pigeon bird house” will have to be cleaned. What do pigeons eat if it’s a homing pigeon? The same diet must be given to him like a normal pigeon. If you decide to keep homing pigeons make sure you educate yourself about how to keep pigeons as pets. Pigeons make great pets but need a lot of care and love from the owner. Good housing is required and also medical aid to the birds. I hope you liked this ‘What do pigeons eat’ article.